Rebound Physiotherapy was established in 2006 by Peter Russell. It was a humble beginning, starting in a room no larger than most offices as this was the only available floor space at the Auchenflower basketball stadium. There were no fancy machines, treatment was hands on, individualised and private. Peter found that this was a successful approach – patients kept coming back and referred their friends. Today those qualities still remain central as the clinic has evolved. These days the practice has grown to accommodate two private treatment rooms equipped with modern equipment as well as access to the neighbouring Acceleration gym. We have all the tools and experience at our disposal to cater for whatever your injury requires. 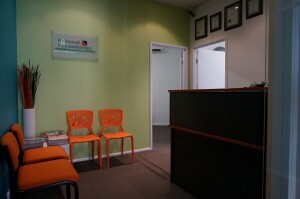 Rebound Physiotherapy was established to service the inner city suburbs of MILTON, TOOWONG and AUCHENFLOWER. We treat people from all walks of life and being positioned in a sporting complex we naturally see a large number of sports injuries. We also have significant experience in the rehabilitation of ankle, knee and shoulder operations. Our niche is fixing injuries and we pride ourselves on our honest, professional and personalised service.